Incredible BLACK and WHITE contrast rarely seen on a 1950 proof Franklin! If this jewel was in an NGC holder there is no doubt we would have a STAR designation on the holder. WOW! The DEEP CAMEO contrast on the obverse is absolutely breathtaking. Finding a 1950 proof Franklin with contrast this incredible is a true rarity. Franklin is dripping with intense snow-white frost surrounded by jet-black pools. There is a touch of golden-orange and teal toning along the obverse and reverse rim that frames the knockout contrast. The reverse offers solid frosted cameo devices. Spot-free, haze-free jet-black fields. I had a client who was picking up every single 1950 proof Franklin in PF 65 CAMEO for a few years and he has tucked them away. The 1950 proof Franklins in 65 CAMEO are getting tougher and tougher to come by. 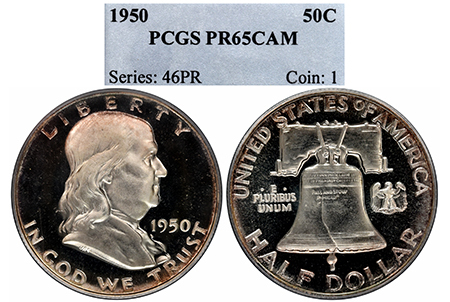 PCGS has only graded 111 examples in PR 65 CAMEO. A great example to tuck away!